Ram Lal @ Ram Avtar …..Petitioner. Versus State of H.P. …..Respondent. Hon’ble Mr. Justice Surinder Singh, J. Whether approved for reporting - Yes. For the petitioner : Mr. Bhupinder Ahuja, Advocate. For the respondent : Mr. H.K.S. Thakur, Addl. Advocate General. The petitioner was arrested in FIR No.22 of 2013, registered in Police Station Manali, District Kullu, for the offence punishable under Section 20 of the Narcotic Drugs and Psychotropic Substances Act, 1985, in short “the Act”, for allegedly keeping in his possession 354 grams of Charas and having intermediate quantity of contraband. 2. Vide order dated 1.7.2013, passed in bail application No.192 of 2013, learned Sessions Judge, Kullu while enlarging him on bail inter-alia imposed the condition of furnishing bonds in the sum of Rs.5,00,000/- with two local sureties each of the like amount, to the satisfaction of the learned CJM, Kullu. 3. The petitioner feels aggrieved by both these conditions being unreasonable and excessive. 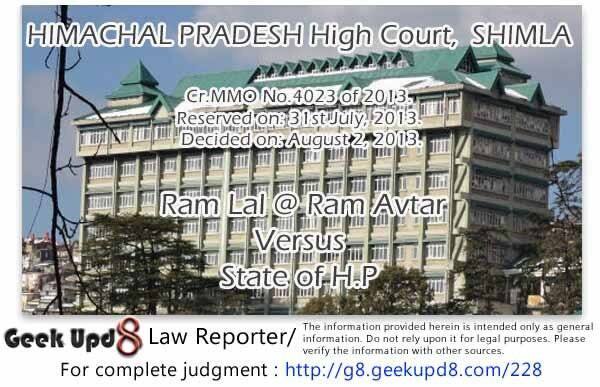 For that he placed reliance upon the judgment passed by this Court in Surender Kumar v. State of Himachal Pradesh [Cr.MMO No.11 of 2009] decided on 18.2.2009, whereby the requirement of local surety held not justified. 5. The allegation against the accused in this case constitutes a non-bailable offence under the Act. In a case of non-commercial quantity, the rigor of Section 37 is not attracted, but however, the general principles of bail apply. Magistrate may impose any such conditions which the Court may consider necessary to a suspected accused of the offences which is punishable with imprisonment, which may extend to seven years or more or an offence under Chapter VI, XVI and XVII of the Indian Penal Code, or abetment of, or conspiracy to ensure the attendance of the accused and further that such person shall not commit any such offence similar to the offence of which he is accused or of the commission of which he is suspected or also otherwise in the interest of justice. the accused also does not have any criminal history. the trial without hampering it and secondly, whether he would subject himself to the verdict of the Court, other facts like the serious nature of the crime and the gravity of the circumstances under which such an offence is alleged to have been committed, the position and status of the accused, vis-a-vis the victim, witnesses of repeating the offence(s), of jeopardizing his own life, its impact on the society and other relevant grounds. 9. Further the bond amount as per Section 440 of the Code would be fixed with due regard to the circumstances of the case and shall not be excessive. However, the High Court or the Court of Sessions can also direct that the bail required by a police officer or Magistrate be reduced if found unreasonable. 441 of the Code, but there is no provision in the Code that the furnishing of local surety can be insisted upon as it has discretion implicit in asking for such sureties. Only requirement is that of solvent surety. 11. Article 14 of the Constitution of India protects all Indians qua Indians, within the territory of India, who is also a citizen of India insisting upon local surety from the accused would be unfree in free India. He cannot be made alien in his own homeland as the republic of India is made all unified stuff as observed by their Lordship of the Supreme Court in Moti Ram and others v. State of Madhya Pradesh [AIR 1978 SC 1594]. 12. For the above stated reasons, the requirement of two local sureties insisted upon by the learned Sessions Judge, could not have been insisted upon and further the bond amount while looking at the punishment provided for the offence alleged to have been committed being quite excessive, is hereby reduced to Rs.1,00,000/- with two solvent sureties of the like amount, to the satisfaction of the learned Chief Judicial Magistrate, Kullu, who shall accept and attest the bonds before enlarging the accused on bail and comply with other directions issued by this Court on 30.9.2011 in Panne Lal vs. State [ Cr.A No.39 of 2011]. 13. With these directions, the impugned order of bail is modified to the above extent. Petition accordingly is disposed of.